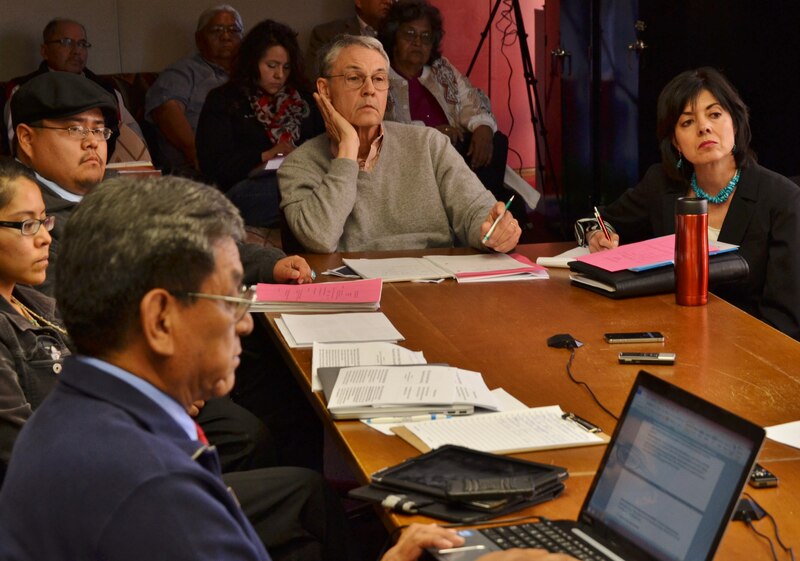 (L-R) Hydro-Uranium Resources Inc. of Texas reports to Navajo Council’s Law and Order Committee about its proposed agreement with Navajo Nation for In-Situ uranium mining near Church Rock, N.M., in Window Rock, Ariz., on April 14, 2014. Committee member Russell Begaye is at forefront of photo. Anti-HRI community members Leona Morgan and Jonathan Perry sit at the table with HRI Vice President Mark Pelizza and HRI assistant Della Duran. Photo by Marley Shebala. On the issue of Uranium, URI/HRI is at a special meeting of the Navajo Council’s Budget and Finance Committee today, April 29, that is being held at Nahatadziil, Ariz., which is in the southern portion of the Navajo Reservation. According to B&F proposed agenda, URI/HRI is giving a report regarding the Review/Update on URI Deed Issues Relevant to RDC Resolution. Today’s report is being presented by Mark Pelizza, Senior Vice President with his assistant Adela M. Duran. And hopefully, if the Navajo Council’s Resources and Development Committee votes to rescind its controversial legislation that created a RDC Subcommittee to work with URI/HRI on a agreement between the Navajo Nation and URI/HRI for URI/HRI to construct and operate an In-Situ Uranium Mining Demonstration Project near Church Rock, NM., the RDC Subcommittee will not be meeting tomorrow, April 30. According to an April 16 memo from RDC Subcommittee Chairperson Delegate Leonard Tsosie to Speaker Pro Temp LoRenzo Bates, the RDC Subcommittee meeting will be at the Navajo Nation Division of Economic Development conference room, which is located in the Karigan Building, St. Michaels, Ariz. The Subcommittee meeting is scheduled to begin at 10 a.m. There are only two members of the Subcommittee. RDC member Delegate Leonard Pete is the other member and Pete serves as the Subcommittee vice chairperson. This entry was posted in Professional Journal and tagged Budget and Finance Committee, HRI Hydo-Uranium Resources Inc., Navajo Nation Council, Resources and Development Committee, uranium, URI Uranium Resources Inc. by Marley Shebala. Bookmark the permalink.